Almost every lunch, dinner, or formal event in Aleppo begins with an endless spread of mezze. Tabletops brimmed with plates of appetizers. Hummus and Muhammara. Labne and cured olives. Roasted nuts and homemade pickles. These are some of the popular ones. There is also yalanjii, vegetarian stuffed vegetables, which I still have to blog about. Every family has their favorites, their own style of hosting, but the common theme is abundance. The food should appear endless — this is the unspoken rule of Middle Eastern hospitality. You’d be hard pressed to find a gap between the plates. 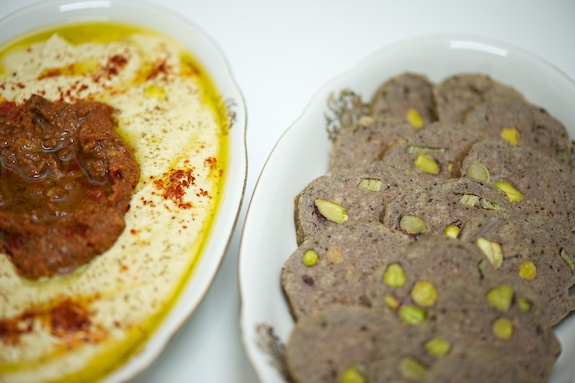 A popular mezze in Aleppo is the Mortadella Halabiye, or Aleppan Mortadella. Not to be confused with the popular Italian cured meat, Aleppan Mortadella is much smaller in size and is blanched, not cured. Also, Italian Mortadella is made from pork, whereas the Aleppan version is made with either beef or lamb. On a couple of occasions, however, I’ve seen chicken varieties, as well. Aleppan Mortadella is usually served as a starter as part of a spread of mezze — leftovers go into sandwiches. This is how my aunt taught me. You take fresh bread — pita or baguette — add a liberal shmear of hummus, cover with slices of Aleppan Mortadella, fanned out, and voilà. It’s that simple. If you add some muhammara to the sandwich, even better; it gives it a spicy contrast, not enough to make you cry though, just smile. 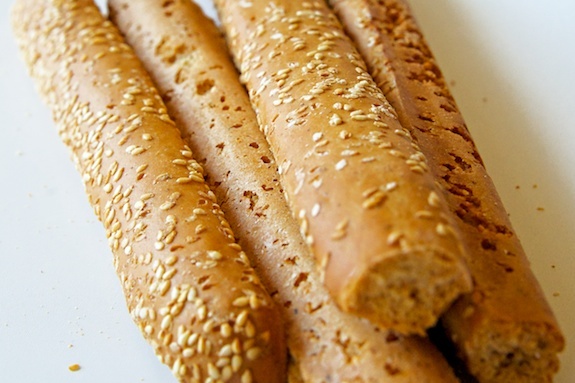 Now, to make Aleppan Mortadella, you want to start out with kaak (كعك), a Middle Eastern kind of bread stick that is incredibly crunchy and usually served alongside tea. Middle Eastern or Mediterranean stores should have it. 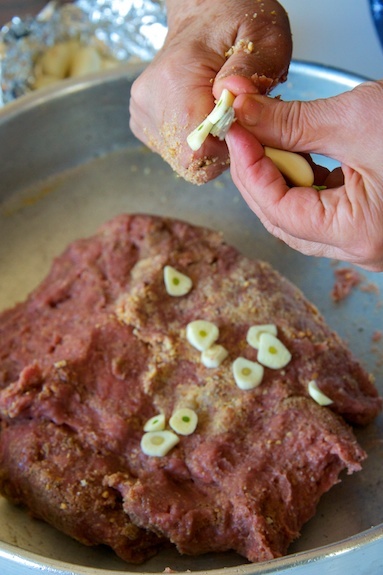 If you can’t find kaak, however, you can use breadcrumbs; ultimately, its goal is to bind the mortadella. The next ingredient is the habra, which is basically very lean meat, essentially fat-less. A good habra should have no fat. I’ve blogged about it before. 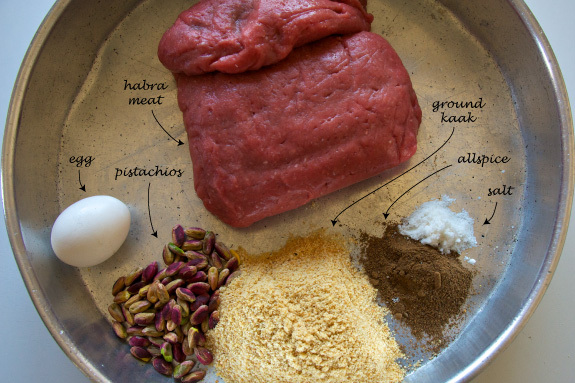 Habra is the basis of all kibbeh, which makes it readily available at any butcher in the Middle East. In the States, however, I usually ask my butcher to ground for me top-round beef, with all its fat removed. My butcher even goes the extra length to ground my meat early in the morning, before they ground any other meat, so that fat inside the machine doesn’t get into my habra. Then, once I get home, I process the meat in my food processor with a few ice cubes until a paste is formed — that’s all habra is. The rest is mixing the ingredients together. I noticed my aunt doesn’t mix the ground kaak with the meat all at once, only handfuls at a time. The reason being you might not need it all. 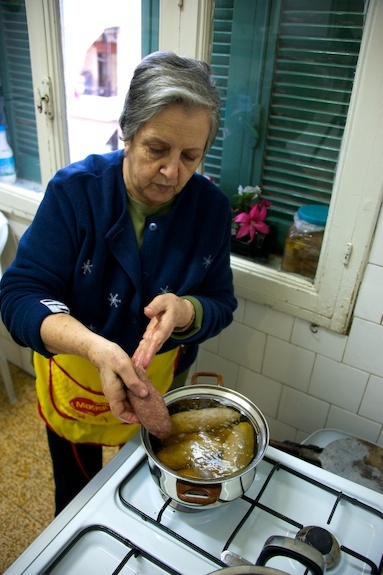 The best mortadella, she told me, is made with as little kaak as possible. Only mix in as much as you need. The goal is a mixture that barely comes together and holds its shape. 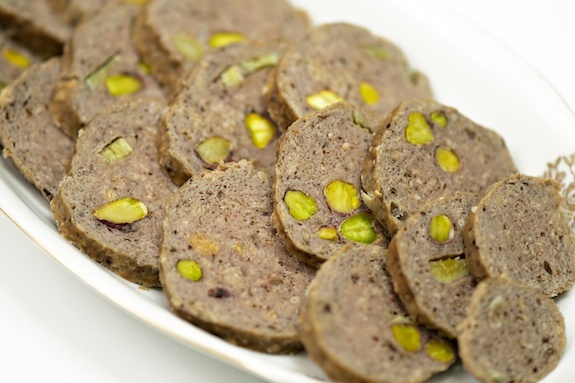 The reason for not mixing the pistachios in the beginning is so that they remain in the center of the mortadella. This is for presentation purposes. Prepare habra, the lean meat that comes from the top-round. In a large mixing bowl, mix together the habra, ground kaak (or breadcrumbs), minced garlic, sliced garlic, and egg, until well incorporated. 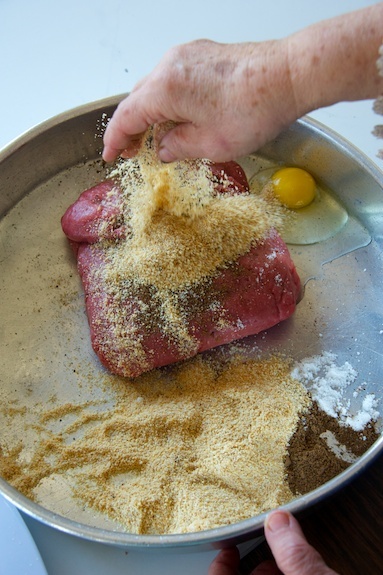 Divide the meat mixture into 4 to 5 equal pieces. 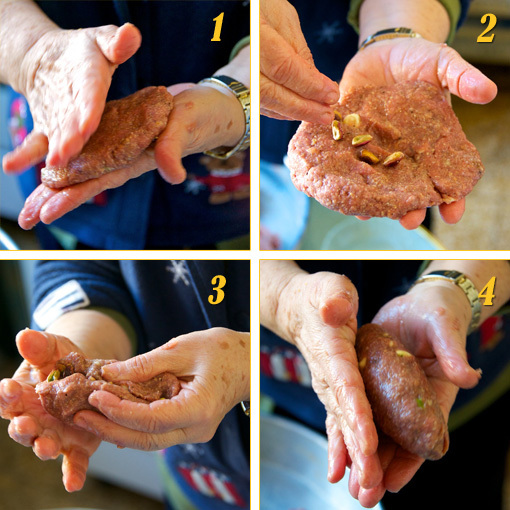 To form the mortadella: flatten a piece of the meat mixture, sprinkle with pistachios, fold closed, and form into a smooth log. 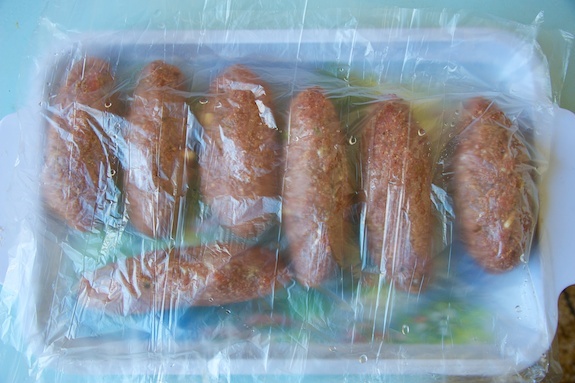 Use ice water to smooth the meat mixture if you feel that it is a bit sticky. Refrigerate until ready to blanch (can be done a day in advance). 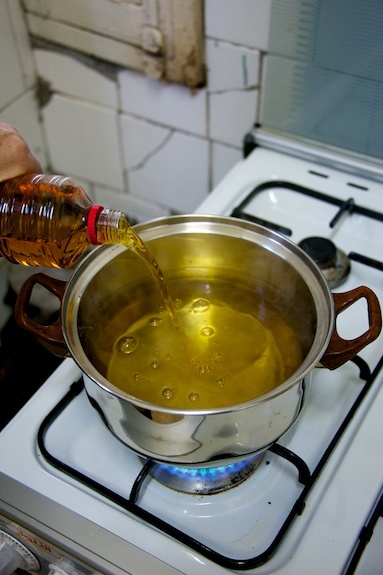 Prepare the blanching liquid by mixing 4 parts water to 1 part apple cider vinegar. 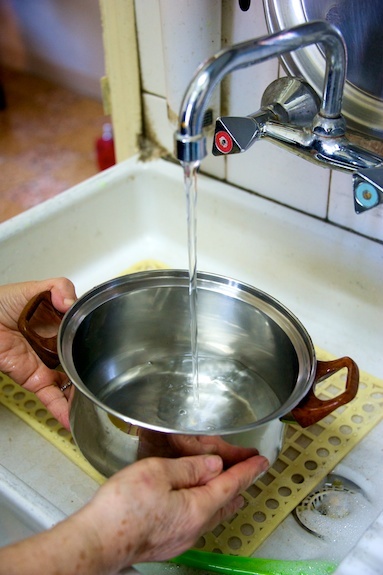 Bring the blanching liquid to a simmer. Add the mortadella and cook over medium heat for 30 minutes or until the middle is no longer pink. Posted in appetizers, Fulbright, Middle Eastern, recipe, savory by Antonio Tahhan on January 17th, 2011. You can follow any responses to this entry through the RSS 2.0 feed. You can leave a response, or trackback from your own site. Just came across your blog, I have a blog featuring Halal Charcuterie, and would like your permission to post your Mortadela and Sujuk recipes there, with of course acknowledgement of yourself and your Aunt as the originators! I love the look of the pistachios in the mortadella. I bet it is just great with hummus and muhammara. how much allspice did you use? oh and any black pepper? Hi Samir, sorry, I updated the recipe: about 1 Tbsp of allspice and we didn’t use any black pepper. The batch we made was almost double, so it looks like we used a lot more allspice. Also, our butcher adds salt to the habra, but if your habra has no salt, the proportion of salt to allspice should be about equal. That said, I never measure salt or pepper when I cook because not only do different salts season differently, but peoples palates also differ; I taste as I go along. When working with raw meat you could sear a tiny bit in a skillet on the side and taste for seasoning that way. I hope this helps 🙂 enjoy! yes..I agree and do the same, salt and pepper and taste as I go along..I just wasnt sure on how pronounced the allspice flavour should be..another thought since the kaak probably has mahlab does that impart a taste or aroma to this? This looks great. I’ve never heard of it before, but I like the sound of it being made for an appetizer. The presentation is pretty! I somehow stumbled onto your blog and truly think it’s great. The photography of the foods is amazing. I’m Syrian and I’m always visiting from college, so I usually leave all of the Arabic food for my family to do since they never really teach the recipe to me, but you’re clear instructions and pictures make me want to start cooking on my own now. I’m such a huge fan now, hope to see more posts. I totally forgot about the puff pastry cups I was looking for….been over an hour on your blog and can’t stop…please keep writing….you bring happiness writing about our beautiful and hospitable Syria and specially Aleppo……. J’ai une amie, armenienne d’Alep dont la mere cuisinait magnifiquement: la mortadelle d’Alep, mais aussi la mohamarra, la confiture de rose, le fromage en torsade et le kaak au formage… etc. etc.Aujourd’hui, la maman est decedee et mon amie vit au Canada alors que je suis a Beyrouth..Je l’ai appelee sur skype pour realiser la mortadelle et elle m’a passe l’adresse de ce blog..
J’espere que je vais y trouver les autres recettes..
J’ai donc fait un kilo de boulettes de mortadelle. Succulentes! Wow! you nailed the recipe for mortadella. 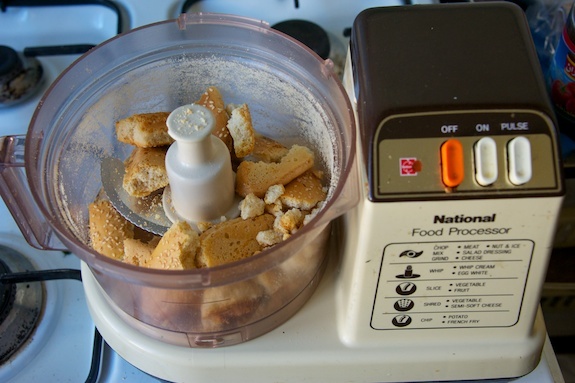 I haven’t made it in over 30 years and seeing your pictures and reading through your recipe flooded me with wonderful childhood memories! Your recipe is EXACTLY like my mom used to make, including the pistachios! I look forward to reading more of your recipes and adventures!